We left Beaufort with the possible intention of stopping at Charleston but there wasn’t room on the megadock so we continued on. After a night at anchor, we headed for the Wacha Wachee Marina. The restaurant overlooking the marina was full of twinkly lights, the music was playing and the tables were full of folks. It was a very lively scene. 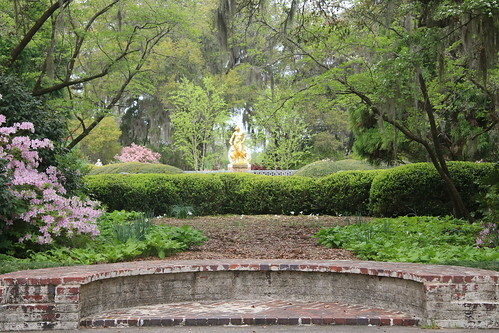 The next day we headed for Brookgreen Gardens before the bad weather hit. 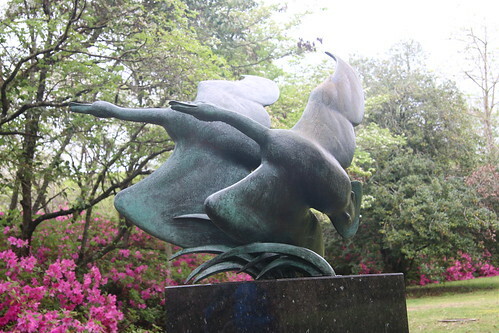 The garden is 9,000 acres filled with American sculptures, supposedly the largest sculpture garden in the world. It also includes old rice fields, a quite effective audiowalk about plantation life for the slaves and various bird and animal displays. We spent Monday and Wednesday at the gardens. Tuesday was windy and rainy so we went car shopping, instead.